2018 has seen the partnership between the Hemraj Goyal Foundation, Barnardo’s and the National FGM Centre develop, with the introduction of a series of events aimed at raising awareness of Female Genital Mutilation. 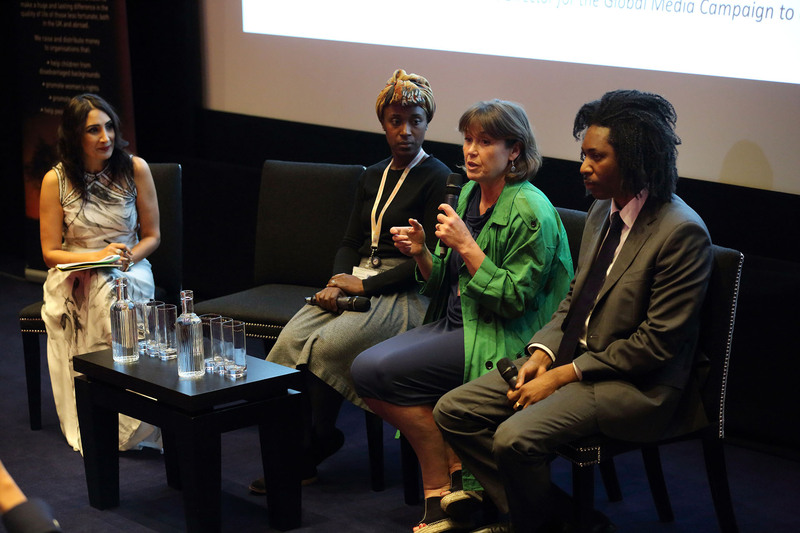 In May we hosted a private screening of Jaha’s Promise at an exclusive venue in Central London, followed by a Q&A session with a panel of experts including Maggie O’Kane who was part of the film’s original production team and now heads up the Global Media Campaign to end FGM. Questions were led by Anita Goyal, Director of HGF and Honorary Chair for the FGM Appeal, who covered everything from the film’s inception to what we can all do to help bring an end to Female Genital Mutilation. One of the key messages guests took away from the event was a sense of encouragement to talk about what they saw and how it made them feel: “The only way to end FGM is by breaking the silence”. The screening was followed a few months later by the second annual FGM Conference, held at the Royal College of Obstetricians and Gynaecologists in July. Over 100 delegates spent a full day hearing from expert speakers across all professions affected by FGM, including social workers, midwives, police representatives, and teachers. The highlight of the conference was an engaging presentation by a group of Year 6 students from Norbury Primary School. The children talked the audience through what they are learning about FGM as part of their science curriculum and introduced delegates to the NSPCC “PANTS” learning tool which helps and teaches children to keep themselves safe from abuse. The inclusion of these students brought a very real side to the conference – hearing children talk about an issue as controversial as FGM was a powerful tool in reminding delegates why they were there: ultimately to protect children. The finale of the 2018 FGM events programme will be the Charity Fashion Show, hosted by HGF in partnership with Barnardo’s, the National FGM Centre and BINTI International; and with a catwalk show created especially for this event by designer Raishma. The fashion event joins the two charity causes in harmony, with the common goal to protect and improve life for young girls and women across the globe. By bringing this collaboration to the forefront of the London fashion scene, HGF’s mission is to educate through celebration, and thus bring London Fashion Week to an empowering close. 2018 has been an exciting year for the development of our partnership with the National FGM Centre and Barnardo’s, and has seen us begin to engage as well with new charities such as BINTI International. The Hemraj Goyal Foundation is growing and we look forward to furthering our mission to end FGM and bring dignity and basic rights to girls and women all over the world. You are invited to a night of fashion, fizz, and fundraising.